Today, you are a member of... The Split Decision - You Are A Member! This week is going to have a lot in common with the boxing match still being fought: who won the superfight between Marvelous Marvin Hagler and Sugar Ray Leonard? Unlike boxing’s number one controversial bout, where Cassius Clay knocked out Sonny Liston with an invisible punch, the superfight didn’t put anyone to the canvas or raise allegations of mobbed-up dives. 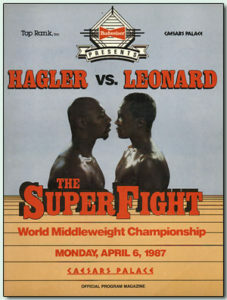 Instead, the superfight ended with a draw in favor of Leonard and Hagler retiring to Italy, a rare case of a boxer never returning to the sport. Critics of Sugar Ray call his victory hollow considering his calculated return from retirement (Hagler had demanded a match for years while they were both active, met always with Leonard’s refusal) and that his fleet-footed flurries simply blinded judges to Marvelous Marvin’s ring generalship and heavy hitting. Those not so impressed by Hagler say Leonard plain out-scored him. Period. But what seems to matter most to both sides of the argument is which style of boxing is preferred: speed vs. power, Ali vs. Frazier, Sugar Ray Robinson vs. Jake Lamotta. This week as you find yourself arguing split decision after split decision remember, ultimately, it’s not about the judge’s decision but what you like to see in the ring.